Imagine you are a baseball fan. Now consider what it would be like if the only information you had on your favorite team was two to three years old, that in the year 2001, you were looking at 1998-99 statistics. You would be getting data on many players who had already left the team, your team might now have a different manager, and the newer players would not even show up. You certainly wouldn’t know what was going on with your team right now. This seems absurd, yet this is precisely the situation we encounter when we seek information about the social problems of this nation. In the year 2001, data on infant mortality, youth suicide, poverty, inequality, health care coverage, and other similar problems are typically two to three years old when made available. Journalists who cover stories about social problems often put in an apologetic caveat when citing these data: "the last year for which data are available." But the lateness of our social problem data, their lack of timeliness, suggests very clearly what we think is important in this country — and what we do not. And imagine how difficult it is to plan rationally or think through the critical problems of this nation on the basis of such outdated information. Getting back to our baseball metaphor, imagine once again you are a fan, and that you want to follow your team’s successes and failures. Instead of turning to the sports section of your daily newspaper, consider what it would be like if you had to figure out where in the newspaper your baseball stories might end up on any given day. Are they in the national section, the metro section, the business section, the science page, the style section, or the health section? Where will they be reported this time? Once again, oddly, this is precisely the situation for information on social problems. Stories about social issues have no journalistic "home," or no "beat," in newspaper parlance. They show up willy-nilly in different sections on different days, depending upon their angle. Few editors are "in charge" of stories on social problems and few reporters have major responsibility for covering issues such as welfare reform, Social Security, Medicare, day care, health care, or other similar public policy issues. They simply show up, as the day’s events might dictate; but the continuity, frequency, and context of these stories are vitiated as a result. Consequently, we know less about the shape and form of our social conditions in this nation than we do about our favorite sports teams. Now for one final return to our sports metaphor, imagine that you were following your favorite baseball team without all the statistics commonly made available that help you understand how the team is doing. You would have no earned run averages for your pitchers, no batting averages for the players, no win/loss record for the team. You would have no summary measures of stolen bases, runs batted in, or errors committed. You would have to try to remember individual actions; your perception of the team would be more anecdotal than comprehensive. You would know far less. And again, this is much the situation for information on social problems. The style of number crunching that goes into baseball statistics is rarely done for social conditions. While figures for individual problems exist, broad summary measures that tell us how we are doing overall are lacking. Are we doing well? Are we doing poorly? How is our population faring? Are we better or worse off than last year? Has this been a stronger decade or a weaker one? Sports is not the only arena in which we keep timely data that are readily available and clearly summarized. An even better example is the way we monitor the economy and keep track of our economic behavior. This is information we want to know and which we deem important. The necessary tools are there. There can be little doubt about the timeliness of economic data. In contrast to the two-to-three-year-old data on social problems, the Dow Jones Average is issued every 60 seconds. EVERY 60 SECONDS! Other stock indexes are issued on a similar timely basis, minute by minute, hour after hour. Most economic indicators are routinely and predictably issued on a daily, weekly, or monthly basis. And these economic data are certainly readily available. Unlike the episodic and fragmented coverage of social problem stories, every newspaper has a business section — often two: both national and international. Most radio stations include an economic report in their hourly summary of the news, as do television news shows. Indeed, these days, entire radio stations and cable channels are devoted exclusively to economic news. The wealth and variety of summary measures in our economic coverage sets a standard by which to judge how it should be done. In addition to stock indexes, there is the Consumer Confidence Index, the Consumer Price Index, the Index of Leading Economic Indicators, the Gross Domestic Product, and the balance of payments. There is no facet of our economy that we do not measure, precisely and predictably. The timeliness of economic data, their ready availability, and the range of summary measures that are provided help make us, as a nation, knowledgeable about the economy. Because we are inundated with data on what is up and what is down, which parts of the economy are strong and which are softening, we have a sense of where we stand on any given day, and in any given year, compared to other years. We know whether employment is good, whether it’s a buyer’s or seller’s market, whether downsizing is frequent, whether the stock market is bullish or bearish. We know these things because we are told about them, regularly, and in considerable detail. Now consider how little we know about our social well-being. Is the infant mortality rate of the nation widely publicized? Can the man/woman on the street casually reel off the current data on youth suicide? Do we know much about the changing rates of poverty or inequality? And what about the less visible aspects of our social life? In health care, we can provide a figure for the numbers of people who currently lack health insurance: 43 million. But even this horrendous figure tells us little about the quality of the nation’s health care, the anxiety brought about by fears that one cannot cover one’s health care bills, the long waits in emergency rooms, or the depersonalization we might experience in the corridors of our nation’s hospitals. How can this situation be rectified? How might we improve the quality, frequency, timeliness, and accessibility of what we need to know about our nation’s social health? One approach is to look at how other industrial nations address these issues. They are doing better. While the United States is first in the world in the production of economic measures, we lag behind on social measures. One vital element that we lack is a national social report of the kind produced in just about every industrial nation in the world — except the United States. A national social report provides a periodic review of how a country is doing on a broad range of social issues. The first report of this kind was produced in England in 1970 and was called Social Trends. France soon followed suit in 1973 with a similar document entitled Données Sociales. In 1974 the Netherlands published Sociaal en Cultureel Rapport, Norway produced its Sosialt Utsyn, and Spain released its Panorí¡mica Social. Since that time virtually every industrial nation has created a national social report, an annual or biennial summary of their nation’s social health, typically issued by the Central Statistical Offices of their governments. What is the value of such a report? It creates a benchmark, an official standard, a reference point for an assessment of how a nation is doing. Its publication is usually noted on the front pages of the major newspapers of a nation, and it provides a distinct moment, a point in time, for a nation to take stock. Are we doing better? Are we doing worse? In what areas? Can these trends guide public policy? Where should we invest our resources? It provides a degree of rationality to a process that is too often politically charged, and it allows, at minimum, an agreement on the baseline — Where do we stand? — even when solutions or approaches may differ greatly. The United States has no national social report, and that empty space urgently needs to be filled. Social policy debate in America often bogs down under the weight of conflicting visions and misinformation. We have few agreed-upon national gauges that tell us where we are and few official yardsticks to judge real progress gained and lost. In their absence, the more extreme forms of rhetoric, ideology, partisanship, and pandering too often take over. To address some of the most serious gaps in the reporting of social issues, I, along with my husband Marc Miringoff and my colleague Sandra Opdycke, have embarked upon several projects intended to provide new models for social analysis in the United States. One of our principal projects is the creation of what we have entitled The Index of Social Health, published annually since 1987. The Index of Social Health is a broad-based gauge of the social well-being of the nation, similar in concept to the Dow Jones Average or the Gross Domestic Product. But instead of measuring the movement of the market or the magnitude of economic growth, it monitors social conditions. It is a barometer of our nation’s social state, a clue to how we are doing. It draws on available government data for 16 social indicators, such as infant mortality, child abuse, child poverty, teenage suicide, health insurance coverage, income inequality, and alcohol-related traffic fatalities, and it combines them into a single number for each year, going back to 1970. 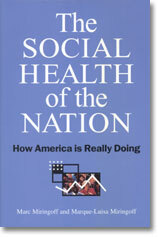 The Index shows that while the social health of the nation was strong in the early 1970s, it has stagnated since that time (see The Social Health of the Nation: How America is Really Doing, Oxford University Press, 1999). Among the 16 indicators are many problems that have worsened since the 1970s. Child abuse reports are at an all-time high, averaging a 33-percent increase in the past 10 years alone. Lack of health insurance, with all its attendant problems, is close to its all-time high, having increased steadily throughout the 1980s and 1990s. Income inequality, or the gap between the rich and the poor, is hovering around its highest point in 32 years. Teenage suicide, though improving in the 1990s, has worsened markedly over the years. A few indicators have improved since the 1970s, including infant mortality and alcohol-related traffic fatalities. But even here, serious problems remain. The infant mortality rate for black infants is more than twice that of white infants. Nearly 16,000 people died in alcohol-related traffic accidents in 1999 (the last year for which data are available). Traffic fatalities, both alcohol- and non-alcohol-related, are the leading cause of death for individuals between the ages of 5 and 24 and the third leading cause of death among adults ages 25 to 44. Another indicator, child poverty, has improved somewhat during the 1990s, but the United States continues to have among the worst child poverty rates in the industrial world. This portrait of the nation’s social health, as measured by the Index of Social Health, is vastly different from the picture of prosperity we heard for over a decade. What it shows is an aspect of American life that has been too frequently ignored. It has been largely omitted from our national discourse, and the public dialogue has suffered as a result. Had this view been more widely debated, more fully integrated into our vision of America, we might have acted more vigorously to address our most serious problems, and the nation’s social health might be far stronger than it is today. Highlighting this omission is the striking contrast in the paths of our nation’s social health and its economic health. While the Gross Domestic Product of the nation, for example, has steadily risen, our social health has slumped. A rising tide has clearly not lifted all boats. To advance the dialogue further, during the past two years we have sought, in our work, to go beyond what can be measured by government statistics to pursue some of the deeper aspects of our nation’s social health through the administration of a National Social Survey. The survey, first conducted in June 2000, is scheduled to be conducted again in January 2002. In the National Social Survey we ask not only whether people are employed, but how they feel about the rewards and satisfactions of their work. Are they working just for the money? Do they feel overworked? Do they think their work contributes to society? In health care, we ask not only about people’s insurance coverage, but also about their experience as patients. Do they receive sufficient medical information? Are they treated like individuals or like a number? We ask how safe people feel in their homes, how they view the schools their children attend, how often they struggle with their finances. We have released the findings of the 2000 survey in a new publication entitled The Social Report — a document that begins the process of creating a national social report for this country (Fordham Institute for Innovation in Social Policy, 2001). It is only one model for how this might be done, and we urge the development of a report that has the official imprimatur of government, a report that can be used by many segments of society. Finally, we have begun during the past year to formulate yet another portrait of the nation by delving into the social health of the nation’s 50 states. In recent years, the states have gained new importance. They have been granted greater authority for formulating and implementing social policy, particularly in the areas of health care and welfare reform. The state-by-state profiles we have compiled show a stunning diversity in the nation’s social health. Some states are doing well on almost every indicator we measure — including child and youth well-being, income, wages, safety, and health care. Others are doing poorly across the board, ranking toward the bottom of the 50 states on most indicators. It is our hope that this comparative approach will contribute to the policy-making processes within the 50 states and provide a gauge by which to measure progress gained and lost. So, how are we doing as a nation — what’s the score? What we know is that in measuring our social health, much work yet needs to be done. We need to catch up to other nations, and to the economic sector of society. We need to pay greater attention to the needs of our citizenry. We need to assess the social state of America with diligence, accuracy, and depth. We need to expand the national dialogue to include a portrait of America that represents not only the nation’s economic health, but also its social well-being. If we can do so well in baseball, surely we can do equally well for our nation’s social health. Marque-Luisa Miringoff, Ph.D., professor of sociology at Vassar College, has served as chair of the sociology department and the director of the urban studies program. With Marc Miringoff and Sandra Opdycke, she is co-author of The Social Health of the Nation: How America Is Really Doing (Oxford University Press, 1999), The Social Report (Fordham Institute for Innovation in Social Policy), and the forthcoming Social Health of the States (Fordham Institute for Innovation in Social Policy). She is also the author of The Social Costs of Genetic Welfare (Rutgers University Press, 1991) and numerous articles on health and social indicators.